Hey guys! Back with another STRAY KIDS review!! 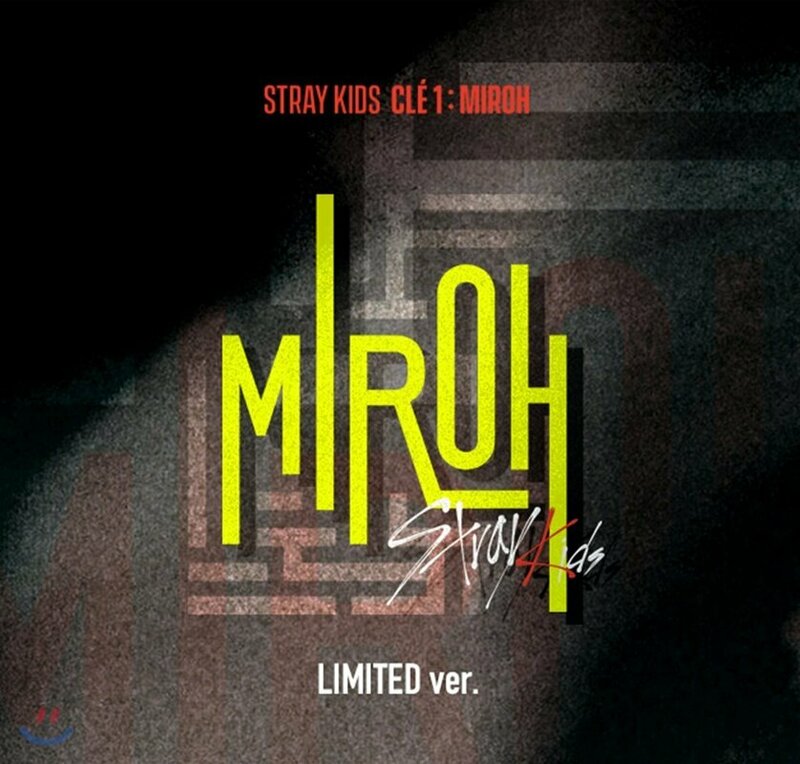 Stray Kids is still one of my favorite groups, and this new album makes me love them even more. I swear, they're actually incapable of producing a bad song. I've downloaded all their songs in all their albums and am obsessed with each one. I'm going to keep the format the same as my first ever album review, starting with a general ranking of the songs, and then reasons why I like, or don't like the song. Let's start! Here's my ranking of each song in the album, aside from the introduction song, "ENTRANCE". I will now talk about each song in order. This is probably my favorite song right now. I love how it's so different from your traditional song. It's separated into four different sections and they switch up the beat for each part. Moreover, there is no chorus. To some people it may seem a bit messy, but for me, I love how unique it is. Not to mention the glorious rapping; each member raps a part in the song, and three members even rap in english! There's a dark somber melody to it as well. It's now my new pre-workout song that I jam to to get myself hyped up! The very first part of the song where my bias Minho (his stage name is Lee Know but I always call them by their real names) starts rapping is so so addicting and pleasing to the ear, and I can't stop listening to it. Honestly there are so many iconic moments to this song, such as Felix' really deep "boxer" right before the musical breakdown, and Jisung's (AKA Han) "I'm gonna draw a picture like Picasso". I really like the overall melodic tune as well. The song really shines in this album and was the one that I was most excited for after listening to the preview days before they released the album. Oh my goodness, Felix' voice just keeps getting deeper and deeper. HIs rap in the first verse is my favorite part of the track. The transition into the chorus is also really catchy. Like MAZE OF MEMORIES, this song is in my playlist that I listen to before working out. At my first listen, I wasn't too in love with the title track, but it has grown on me after repeated listens. It's definitely really unique, since the style of the song is not something you would see in the Kpop industry even as a side track, much less a title track. In their dance accompanying the song, they used inspiration from Haka which is really cool. I love how they incorporated the roar of a tiger in their chorus. The song is just very in your face; it's super loud and exciting. Like MAZE OF MEMORIES, there's a lack of structure; for example, there isn't a breakdown or a bridge. But it's a very catchy song nonetheless. Listening to this song is like I'm going through an out of body experience; it literally feels like I'm just floating in the middle of the universe. There's more singing in this track than the others; their vocals really shine, and the song is more emotional. I really like Jeongin's (I.N.) "watch out watch out" in the song, with his more high pitched voice, and Chan's (Bang Chan) "like a tunnel in the night". 19 is very smooth and relaxing, obvious from the start as the song begins with a slower beat and melody. I love the chorus in this song, how they embellish it with their deep vocal.s There are also a bunch of ad-libs in the song as well which I think goes really well with the overall composition. That was it for my review. Stray Kids never disappoint. Stan talent. Hey guys! As third quarter of my senior year is coming to a close, and as I'm waiting for college admittances to be released, I thought I'd share some things I wish I knew before I started my four years in hell. Let's begin. I remember in sophomore year where I tried so, so hard to get all A's, but ended up getting a B in the same class for both semesters. I just remember feeling like it was the end of the world. Obviously, now I realize that that one B wasn't worth my stress and tears. I'm glad that I did try my best in that class, however. 2. Don't underestimate the power of sleep. Sleep is so important to function. The days where I got 7-8 hours of sleep, I was not sluggish and I didn't feel sick at all. My head was clear and I was able to focus in my classes. However there were many more days where I was able to go to sleep as early as 10:30 PM but stayed up doing nothing and going to bed at around 1 AM, which greatly affected my performance and mood the next day. 3. It's not like what movies make it seem like. I've watched many teen movies in my day, and they over exaggerate all the drama. High school is nothing like that, at least for me. I literally don't know what's going on half the time because I'm not all up in other people's business. Anyways, select movies did make it seem like there were different cliques and groups in high school and that a bunch of stuff happens everyday, but that's really not the case. 4. It's okay to miss classes when you need to. This is something that I finally understood coming into senior year, but back in sophomore and junior year, I never wanted to miss a single class, even when I was feeling really sick. I just felt that I would miss something really important and that would affect my overall performance and grade in that class. And especially since I wanted to maintain a good GPA during those years for college applications, so I would go to school even when I felt extremely tired and not myself. But I learned that taking time off is necessary to get back on track faster, even if it means missing a day of school or two to do so. As the realization that I'm not going to see most of my friends after college begins until Thanksgiving Break sets, I regret not hanging out with them as much as I would have liked. That being said, I still have the rest of the school year and parts of summer to make up for that. These are just some of the things I wish I knew before transitioning into high school. If anyone out there who is reading this is going into high school soon, I hope these tips helped. I've always been deeply interested in the arts. I started my first art class when I was 9 years old. It was centered on color pencil and watercolor. I just fell in love with at first copying images and pictures, and then creating my own masterpieces. More recently, about 5 years ago to present day, I switched into charcoal and oil paint, exploring as many approaches as I possibly could to really discover the one or two special mediums that I enjoy the most. But, the form of art that I enjoy the most is, without question, digital art. I never fully explored digital art until about a year ago, when my family got an iPad Pro. I've always been fascinated with digital creation because of the technology behind it, but I didn't have the correct resources for it, and drawing with a mouse was basically impossible. And it's not like my parents wouldn't have provided me with those materials either; I was just too modest to ask them for a tablet, stencil, and software. However, like I mentioned before, after we received the iPad Pro from a family friend as a gift, I downloaded a couple free digital drawing apps, including MediBang Paint Pro, which to this day is definitely still superior out of all the free options out there, and started exploring and getting used to the Apple Pencil as opposed to traditional materials. The iPad Pro belongs to my family as a whole but honestly I keep it in my room all the time and none of my family members really use it anyway, so it's essentially mine now, LOL! The discovery for my passion of digital art was sparked during college app season. Back then, since I was just starting my journey, I wasn't sure if it was something that I could make a living out of, so I stuck to a safer approach and chose the business path as my major on all my applications. A big part of it was also that I didn't talk to my parents. I thought that they didn't want this specific career path for me; they were both business majors and I always remembered in the back of my head that they wanted me to follow in their footsteps. However, some time after submitting my college apps, I don't remember how, but my parents and I got into a conversation about college and my future life in general, and I discovered that they just wanted me to do whatever I felt right doing. I said that I wanted to change my major to the digital arts when I got to college, and they were very supportive, and actually excited for me as well. I still need to do more research on all the colleges that I have applied to and have been accepted to, but for now, my plan is to attend SFSU because they have the major Visual Communication Design which I can switch to ASAP, and something special about SFSU is that they have an minor specifically centered around animation, something that all the other colleges that I applied to lack. And anyways, SFSU is a great college for the arts and humanities. By switching my major, I'll be better able to prepare for a job that I actually want to have in the future, whether it be a graphic designer, creative director, animator (which is probably my dream job, working for companies like Pixar and Disney), or anything related to digital design and art. I'll also enjoy my college experience way more if I'm studying something I'm passionate about. Anyways, I just wanted to talk more about myself and one of my passions. Hope you enjoyed reading, and happy Sunday! Hey guys! For today's post I wanted to talk about what I did on my pretty busy President's Day weekend. Let's begin. Friday was a school day, so the same old routine happened. However, right after school was the Liam Payne concert that my school had won in a contest, which was really exciting. Once the bell rang, signaling the end of class, we ran to the gym (where the concert was taking place) and got in line. We also got a bunch of free merchandise including sunglasses, t shirts, tote bags, hats, and posters. We waited an hour for Liam to show up and the concert was only about 45 minutes. Honestly the concert was just how I expected it to be; me being me, I'm not a big big fan of events where it's crowded and loud, but I decided to go because, hey, it was free and it might be my only chance in my life to see a famous person up close. So I went, stayed off to the side of the crowds, listened to some good music, cheered a lot, and that was it. Also, since we waited so long for the actual concert to start, we all started feeling super restless, and the hosts kept trying to stall by throwing out free goods into the crowds, but most of us weren't having any of it and just wanted Liam to come. Oh, and I forgot to mention, during lunch I sat and ate in my car with my friends since it was really cold and rainy. My friend suddenly received a text from her other friend (who was also sitting in a car about 5 cars down from where we were parked) and the text said that Liam just walked by her car. We all dropped what we were doing and started looking around for him, and we saw him! Well, the back of him. We were lucky to get even a view of that since he had a group of bodyguards with him. But it was extremely exciting. It was 5:00 when the concert ended, and I had a good chat with my friend in my car while she was waiting for her parents to come and pick her up. I quickly drove home and ran a mile on my treadmill, then texted my other friend to come over and try on my prom dress, since she wanted to try one in that style. We did that, snacked a lot, and watched Mike Chen on YouTube (my favorite to binge!). Later that evening, I had dinner at a Chinese restaurant with my family. On Saturday, I went to Costco and bought 5 big bags of my favorite Coconut Clusters. We also finally got a proper blender - the Vitamix V1200 to be exact. I can't wait to make smoothies after working out. Anyways, it was a pretty chill day, as after we ran our errands, we went back home and watched the NBA all star events - the skills challenge, 3 point contest, and dunk contest. On Sunday, I had art class, then went to work from 1-4. Sunday was also a chill day. I went home, exercised, washed my hair, and watched the NBA all star game. I had a really good dinner of homemade garlic olive oil spaghetti. I went to a Japanese restaurant for lunch with some family friends. After that, we decided to drive all the way to Palo Alto (about a 30 minute drive without traffic) just to get some Boba Guys from the store that opened recently at that location. We stood in line for about 20 minutes (which isn't bad at all considering that it's Boba Guys; we expected way more people), and after ordering, waited only five minutes for our drinks. My dad and I got the classic black milk tea with boba, and my mom tried the lavender black milk tea. My brother got two drinks: the black milk tea with boba and the strawberry green tea with grass jelly, LOL! Afterwards, we also walked around and shopped at the nearby Stanford Shopping Center. We also stopped and rested at a cafe. I shared a delicious ham and cheese croissant with my mom. We drove back home, ordered Buffalo Wild Wings, brought the wings back home and had a quick dinner. And that was the end of my fun weekend. Now, this may not be a busy or eventful weekend to some of you, but I'm a person who usually doesn't go out / see friends over the weekend. So this was over the norm for me, but it was fun. Hope you enjoyed reading, and happy Sunday! Hey everyone! For today's blog post, I was actually inspired by Deanna (http://deannastilwell.com/) to do something like this. Go check out her post at (http://deannastilwell.com/2019/02/09/week-3-of-dieting/). Basically, I've been watching what I eat for quite some time now, and I wanted to share with you what I had for breakfast, lunch, and dinner everyday this week. I'm not on any strict diet. I'm still eating a lot of the things I want to eat, which is ideal. I'll also be noting which days I exercised. Let's begin. Also, a side note: these measurements of food portion are estimated. I have a one boba a week system going on, and unfortunately I quickly used that on Monday. I got kumquat lemon green tea with lychee jelly from Happy Lemon. Thursday was Valentine's Day, so I thought I would treat myself. I ate a lot this day, LOL! Snack: As I had a Liam Payne concert right after school, I didn't eat a snack. Breakfast: I don't get up early on Saturdays, so I didn't have breakfast. Snack: I don't snack on weekends. So here I would like to take the time to explain my system that I have going on. I normally have work on Saturdays, so usually Saturdays will be the one day of the week where I eat one meal the whole day. But this week, I was scheduled for work for Sunday, so that's why on this day I only had dinner. Breakfast: I also don't get up early on Sundays, so no breakfast! Lunch: Once again, I had work, so I skipped lunch. As you can see, even though I eat much healthier for lunch this year and much less when I eat dinner at home, as opposed to last year, where all I ate was carbs, carbs, and carbs each meal, my system is not strict. I give myself a lot of room for boba and sweets, in moderation of course, but I can never give these treats up. I'm also exercising WAY more this year than last. I like that I have one day of the week where I eat way less as well, the day where I go to work, and I honestly feel the same throughout the day as if I did have something to eat for breakfast and/or lunch. Hey guys! Welcome to the second part of my new year's resolutions. Let's begin! Last year, I started sleeping super late. I used to sleep around 10:30, but I saw my bedtime slowly approach midnight. Right now, I go to bed a little after midnight, on a good day, and I probably get less than 7 hours of sleep. I also find myself super tired and unable to focus at school. You'd think that my body would get used to this later sleep schedule, but nope! It hasn't. So I need to work on that this year and get back to a healthier sleep schedule. 2. At college, find a new job. Yes, I'm going to college this year in September. I want to find a part time job to make a little pocket money. I probably won't intern at a position related to my major until my third year, so as a side job I kinda want to be a bobarista again. That's my current job, and I really like it a lot. I get free unlimited boba and snacks at the place I currently work at, which is more than I could ask for. Hopefully my future part time job at college will be like that as well. But yeah, I just really like concocting drinks, and it's even better when I actually like the drinks I'm making, as opposed to if I was working at Starbucks since I don't really like coffee that much. Let's hope for the best. 3. Learn more about Kpop. I got into Kpop last year, and I'M SUPER OBSESSED. I'm currently stanning about 6 groups. Kpop (and not just listening to the songs. I'm talking about stalking their instagram pages, watching fanmade YouTube videos about all the groups, not to mention binging the groups' reality shows on YouTube as well) has taken over my life. But I couldn't ask for anything better. Kpop has positively changed my life. This year, I want to learn about more groups, and this will actually be beneficial for me, as I'm going to South Korea over the summer. Maybe I'll be able to recognize these groups when their faces appear on the sides of buildings or on posters. 4. Read more Webtoon series. I also recently got into reading Webtoon series, which is actually my most favorite thing ever. There are so many good stories, and I love how everything's free. I appreciate all the artwork that goes into it as well. 5. Learn how to do makeup. The only thing I know how to do is curl my eyelashes, and that doesn't really count as "doing makeup". I've been practicing my eyeliner, but it looks terrible, LOL! I also want to learn how to do brows, definitely. But yeah, it's something that I've wanted to get into since last year, but I haven't had the time to really fully learn. That was part 2 of my new year's resolutions, hope you enjoyed. Happy Sunday! Hey everyone! Today I'm going to be focusing on some resolutions I have for the new year. Let's start! 2. Run 4 miles a week. I really want to get back to running miles under 8 minutes. I'm currently at a 8:50, which is already pretty good since I started at a 10 minute mile when I first began working out on my own. This is definitely one of my top resolutions for this year. So far, I've been achieving this goal pretty easily, so I'm hoping my motivation lasts through the whole year. 3. Work on creating more meaningful content for this blog. Like I mentioned in my reflection post, I really want to spend more time on this blog and make my content more meaningful and relatable. Making improvements to this blog in general is something that I want to focus on. 4. Work on more art for Instagram art account. I have an art account that I just started recently, and so this resolution includes growing my account and getting better at drawing, and spending more time on each individual post. ​ 5. Edit more videos. I really like editing because I get to explore cool effects and sequences and everytime I edit a new video, it's always a huge learning experience. It's a creative process, and it's something I enjoy doing, so it's definitely an activity that I want to spend more time on. Part 2 will be out next week. Thanks for reading, and Happy Sunday! Hey everyone! Today I'm going to be reflecting on how I did on my 2018 new year's resolutions. I will be rating myself on how well I think I did, with 1 being really bad, and 5 being excellent. Let's begin! I started exercising about once a week from the beginning of the year to the end of school, and over the summer, the number increased to 3 times. I couldn't keep up the trend when senior year started, though. However, I found myself more and more willing and motivated to get out of bed at 10 AM (yes, I love to stay in bed until noon, even if I've been up since say, 9 AM) to exercise. Because of that, I gave myself a lovely 3/5. The only time I can recall this year where I made myself drink more water was the last couple of weeks, where I was EXTREMELY constipated. Because of that little incident, I started drinking a LOT more water in those weeks. I've stopped drinking that much now, and I'm probably going to regret it when I get constipation again. I really wanted this resolution to work out, but even with knowing the pain that comes with irregular bowel movements, I still can't seem to bring myself to drink more water even to avoid that discomfort. At the beginning of the year, I limited myself to one boba a week, which was a pretty good system. However, over the summer, I started working at a boba shop, and I gotta take advantage of the free boba, you know? Also, I'm not even going to go into detail my 7 boba drinks I got over thanksgiving break, which was like, 10 days. But anyways. Even though this was one of my top resolutions of 2018, I honestly don't regret it. At least for now. I probably will regret this when I get diabetes. So, I'm not giving myself full score for this, even though I did indeed keep this website going, and didn't quit. I'm just not completely happy with the quality of my content. But persevering is step one. I got myself over 650 followers on Twitter! Super stoked about that. I started participating in class a teeny, tiny bit more. However, it's really just not my thing, you know. It never really got easier for me, which I thought it would with more practice. I'm an ISFJ by heart, so it's my personality, how I was born. I was a bit more vocal in the group discussion level, though. Yes!!!! Over the summer, I hung out A LOT. At least for me. For the average person, the amount is probably average. Anyways, I would hang out with someone at least once a week over the summer. As you all know, this was the period of time when I started working at the boba shop. My friends would always visit me, and when my manager wasn't there, I would sit with them outside of the kitchen / drink making area, outside at the customers' tables, and just chit chat, and provide free boba (don't tell anyone!). I was pretty successful with this resolution. I took 1 point off because this was only during summer. During spring, thanksgiving, and winter break, I kept to myself pretty much, with part of the reason being that I was extremely busy with schoolwork. I didn't read much over summer because I was busy with other things, but I did read more through the school year, and during the shorter breaks. So I give myself 50% for this resolution! I definitely did not do well on this resolution. Even with more practice from the presentations I had to complete throughout the year, it was the same every time: just straight up anxiety. Like the other resolution where I tried to be more vocal, I honestly don't think this is something I can change, unless I was forced to speak in front of people, like every single day. I ended up downloading some news apps such as CNN on my iPhone, and just scrolling through it a couple times a day. It went on like this for maybe a few weeks, and then I ended up slacking off, and didn't check it as much. But, I'm definitely more informed this year than I was last year, so that's a positive! The only writing I do for fun is this blog, Initially, I wanted to start writing stories, even fanfiction (LOL), but I just never had time to do it. Okay, so about a month ago, I went two weeks (!!) without nail biting, which was a HUGE accomplishment. Other than those two weeks, my nail biting habit has persisted. I just can't seem to quit! I need to do something like paint my nails with clear nail polish to help with this habit. Overall, I'm not elated, nor disappointed with the results of these resolutions. I definitely could have done more, but I did put in *some* effort, which I remember did not really happen in previous years where I had a list of resolutions as well. Next week, I'll be sharing updated resolutions for 2019! HAPPY NEW YEAR!!! 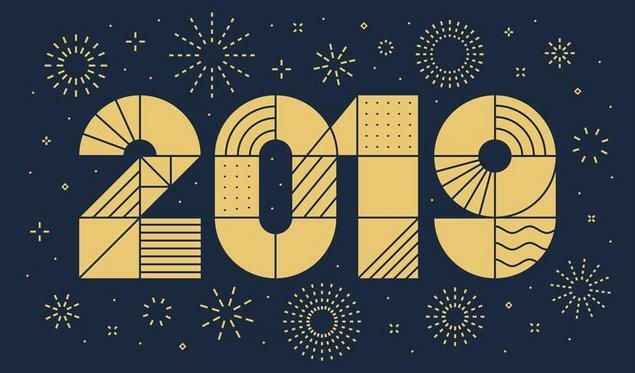 It's finally 2019, and I'm really excited for what this year will bring me: graduating high school and starting my college experience. It's really exciting to think about. However, I still have 6 months until graduation. I have the last part of my senior year to get through, and then I'll be done! Anyways, I'd like to take the time in this post to reflect upon my one year of blogging. I started this blog, and am continuing it, solely as a hobby. I love to write about my interests, and my blog is here for just that. I don't regret spontaneously starting this blog, because not only has it given me something to do and made me think creatively, but it has introduced me to a new community of people, and even quite a few blogger friends as well. When I started this blog, I had so many people give me advice that really helped. I want to give thanks to them, and all of you who are reading this post, for spending time to take in my words. However, this journey has not been without a few bumps. I noticed that over the year, my motivation for continuing really went down. The main problem was time. Starting the blog as a junior in high school was challenging, and I often rushed through writing my posts, read over them once, and published them without a second thought, just to avoid breaking my one-entry-a-week schedule. I would always run out of ideas on post topics as well, but going through other people's blogs for inspiration, and of course having the sudden moments of insight, have definitely helped a lot. And thankfully, my love for blogging is still here. It may be buried deep down, but I can still feel it. I hope that in the new year, my motivation will be replenished. The main goal I have for this blog in this new year is to revamp it. I have the materials and resources needed to digitally draw a banner for the website. In general, I want to change the look of it, because the style of it right now is getting pretty old, and a bit too bland for me. Different headers, buttons, maybe even a new logo will help to refresh the website. Another goal I have is to produce more meaningful content, and to spend more time drafting and editing my entries. Of course, like I said before, the quality really went down because I just didn't have time to really work on my blog. I'll work hard to fix that this year. With all this being said, once again I'd like to thank everyone who has supported me through the year, and here's to another year of blogging! Hey guys! Today I thought I would post about Sugarfina, which is a luxury candy brand. They produce sweets such as gummies, jelly beans, and chocolate. My mom loves purchasing candy from this company. Recently she bought two small boxes of gummies, pictured below, and I will be talking about my view of this brand. One of the main reasons why my mom loves this brand is because of their Hello Kitty collection. She would even go as far as to spend $8.50 on each box. Yes, you heard me right. Each small box costs around $8 to $9 dollars. 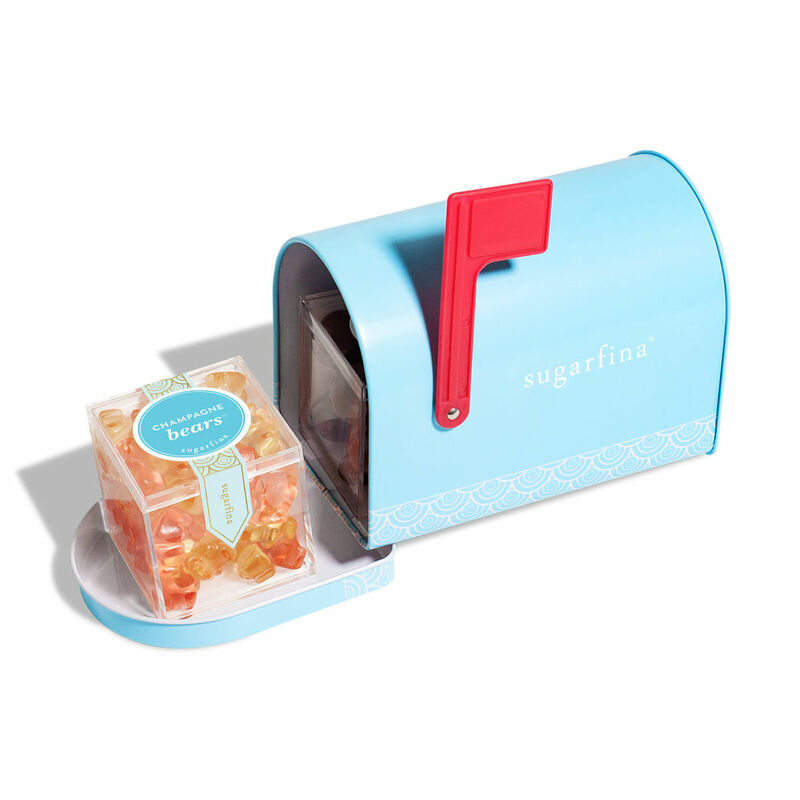 However, Sugarfina incorporates some really special flavors into their candies. For example, there are gummies flavored like alcohol, including a champagne flavor, and a rosé flavor. My personal favorite is the apple pie flavor of the hello kitty gummies pictured above. I recently tried some that were pear flavor, and those were pretty decent as well. The packaging is simplistic and minimalistic, which is something that I really appreciate. Look at how sleek the box looks, the perfect right angles, and the little sticker sealing it on top. 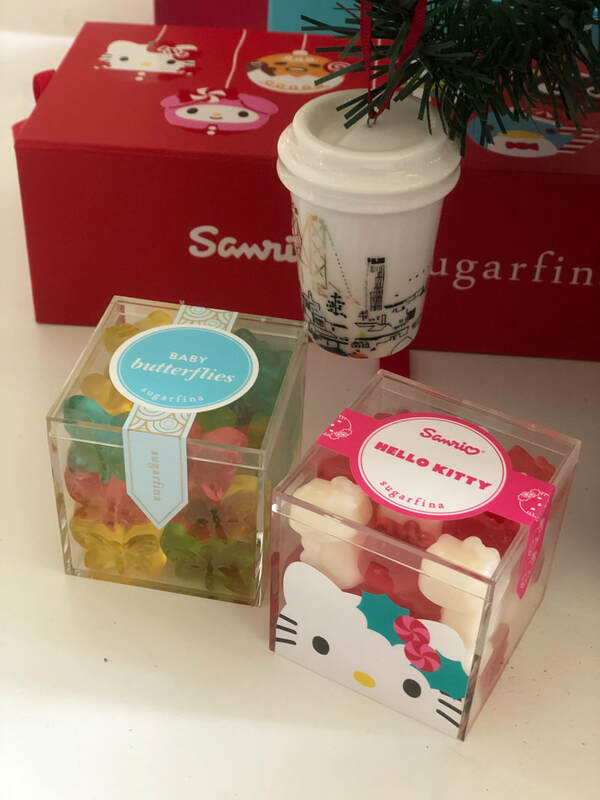 Sugarfina also has cool packages that you can customize what candy you want. My mom recently got the mailbox one. Pretty much, you choose whichever two candies you want, and they'll send it in a cool mini mailbox that you get to keep. This is worth it if you get the candies that are originally more expensive, because the mailbox package is set at a price, no matter which candies you get. Pictured below is the mailbox. Anyways, this time my mom got the butterfly gummies, and the hello kitty head gummies. Like I mentioned before, the hello kitty ones were flavored like apple pie, but it's really just an apple flavor. As for the butterfly gummies, from what I can tell, the flavors are lemon, lime, strawberry, and another type of berry that I can't quite discern. Unfortunately. on the Sugarfina website, they don't list the flavors of the butterfly gummies, so this is purely from what my taste buds can tell. But they are quite delicious, though. Once I start munching on them, I can't stop. Some of the past boxes of gummies we got (of which I unfortunately do not have my own pictures) include the strawberry Hello Kitty gummy bows. We also got other types of candies, like the chocolate pearls. All in all, it is quite expensive, and I wouldn't say that this is worth the purchase. But I think as a one time thing, just for the experience of the flavors and the nice packaging, it's alright. I can see why the brand is attractive to those like my mom, and makes them want to spend money on these products. Thanks for reading my short take on Sugarfina. Happy Sunday! Blog posts basically about anything remotely interesting going on in my life.